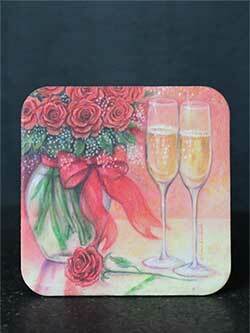 Champagne and Roses Coaster, by Legacy. These bestselling cork-backed coasters are heat and water resistant, thanks to a plastic laminate. They measure 3.75 inches square. This one features artwork of a vase of roses and a pair of champagne flutes. Hearts and Strawberries Coaster, by Legacy. These bestselling cork-backed coasters are heat and water resistant, thanks to a plastic laminate. They measure 3.75 inches square. 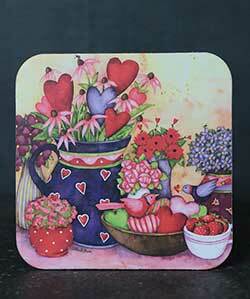 This one features artwork of bright bowls and pitcher of hearts and strawberries, designed by Debbie Hron. 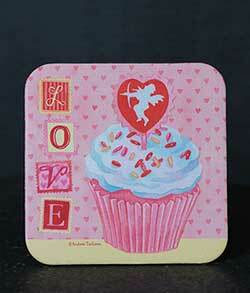 Love and Cupcakes Coaster, by Legacy. These bestselling cork-backed coasters are heat and water resistant, thanks to a plastic laminate. They measure 3.75 inches square. This one features artwork of heart-topped cupcake and LOVE letters, designed by Andrea Tachiers. Love Sampler Coaster, by Legacy. These bestselling cork-backed coasters are heat and water resistant, thanks to a plastic laminate. They measure 3.75 inches square. 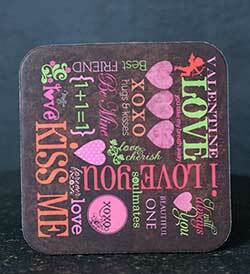 This one features artwork of Valentine's Day phrases on a black background.